Within the first chapter of this book, the author shows us the two most important reasons for the failure of the 1815 Belgian campaign. First, the French Army had some royalist officers and men who defected to the Allies. The amount of these defections are usually glossed over in other books on the campaign. Second, without Berthier as Napoleon's chief of staff, the Imperial headquarters seems to have been run in a very sloppy manner. Officers did not know where all their troops were, and many messages between the different staffs seem to have been missed. While not a competent field general, Berthier deserves to be listed as one of the best chiefs of staff ever. His not returning to serve under Napoleon in 1815 is probably one of the key reasons for the failure of the campaign. As far as the desertions, the author states that four Carabiner officers deserted on the field of Waterloo. The author does a very good job of detailing the performance of Marshal Ney from the 15th to the 18th of June 1815. He shows that Ney was handicapped by a lack of staff when he was appointed to the command of the left wing of the French Army by Napoleon on June 15th. Mr. Dawson shows how unnaturally timid Ney was on both the 15th and 16th of June. He goes on to show how nearly maniacal Ney became on the field of Waterloo. Unfortunately, we have only the written orders from the campaign, but the accompanying verbal orders have been argued about for more than two hundred years. In the author's eyes, among others, Ney lost the campaign by ordering d'Erlon's 1st corps away from the edge of the Ligny battlefield to help Ney at Quatre Bras. Of course, some of the blame also rests on d'Erlon for following Ney's order and not Napoleon's. The author shows that Ney unequivocally was sent, and received, a message from Napoleon that made it plain that Napoleon intended Ney to be part of a 'manoevre sur les derrieres' (move onto the rear) of the Prussian Army at Ligny. Ney's capture of Quatre Bras was supposed to be a movement to forestall Wellington being able to move to help the Prussians. As the book shows, Ney was hardly the best Marshal for Napoleon to have picked to have a ? command. His track record in 1813 should have precluded him in this command, but Napoleon had only so many Marshals to choose from. Whilst Ney was nicknamed by Napoleon 'the bravest of the brave' (look at his exploits leading the rearguard from Russia), he was not the smartest of the smart. 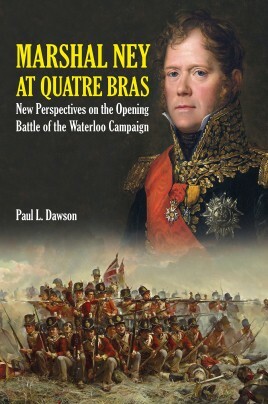 If Davout or Soult had been in charge of the left wing, they probably would have captured Quatre Bras, and d'Erlon would have helped crush the Prussians at Ligny, thus making the Prussian Army unable to intervene on the field of Waterloo. Ney was the only marshal charged with treason after the second fall of Napoleon. This brave man was sentenced to death, and shot by firing squad. Ney's supposed comments at his execution were " Soldiers when I give the command to fire, fire straight at my heart. Wait for the order. It will be my last to you. I protest against my condemnation. I have fought a hundred battles for France, and not one against her ...soldiers,fire!"